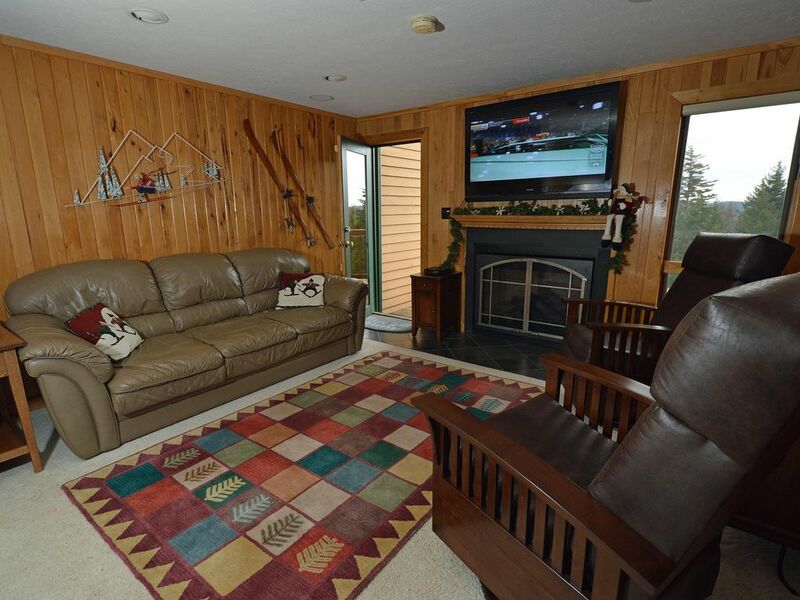 2 BEDROOMS, 2 FULL BATHS, 1 HALF BATH: Ski In / Ski Out, Gas Fireplace. MASTER Bedroom: Pillowtop King Bed, TV/DVD, private bath. Bedroom # 2: 1 Queen Bed, AND 1 Set of Twin Bunks. TV/DVD for all the kids. PLUS: Large Flat Screen TV/DVD in the Living Room. Free WiFi. Free Long Distance. Park on one side, ski on the other. Two story. Living, Dining, Kitchen, half bath on main floor. Bedrooms and 2 full baths upstairs. AMENITIES: Washer/Dryer. Large exterior deck overlooks the slopes. Ski gear storage entry. Thoughtfully prepared with high quality linens, lots of towels, paper goods, soaps and detergents. Complimentary full bag of STARBUCKS Coffee for you. Popcorn for the kids. LOCATION: On the north end of the main ski area. Fronts on Camp 4 Trail, a Novice trail leading to all the slopes. Ski home from the top of Powder Ridge Lift. One chairlift ride away from the Double Black Diamonds of Western Territory. Or, ski into Snowshoe Village for lunch at Foxfire Grill, our favorite. Shuttle buses come to your parking lot from early until late to whisk you to Silver Creek for night skiing until 9 pm each evening. ENJOY: Excellent for a family with a number of children. Powderidge units are townhome construction, large, spacious floor plans, plenty of room for everyone in your party. Two story. Main floor is level with the parking lot, no exterior stairs. 2 Bedrooms and 2 Full Baths upstairs. Very peaceful location with memorable sunrise views each morning. We enjoyed our stay. The place is well cleaned and more spacious than the pictures seem.